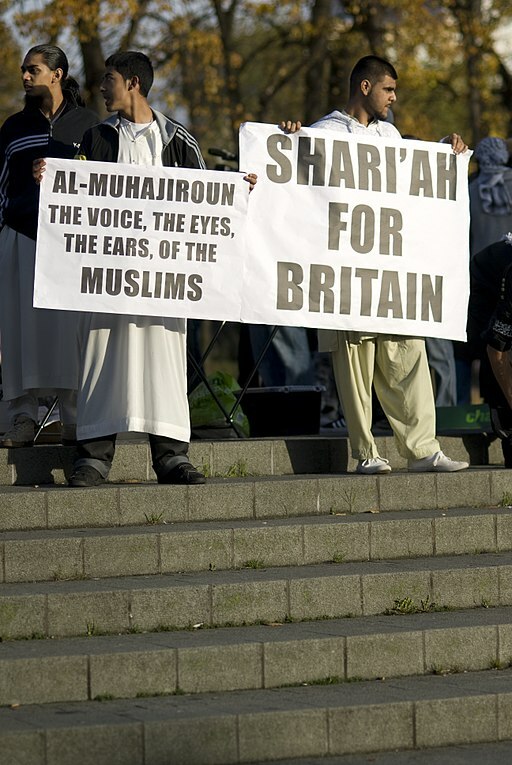 What Will Happen When Islam Takes Over Britain? | Have Ye Not Read? The short video at this link features Pat Robertson of the 700 Club lamenting the fact that Islam is rapidly taking over Britain. If you watch the video, at the end, you can see the clear look of pained exasperation on his face and hear it in his voice, as well. In response to a question from his co-host, who asks if there’s a plan in place for the British to reverse the Islamic tide, Robertson states, “Well, the British have lost their faith in Christianity. And they’re wide open for anything to come in.” And that’s true, in the sense that when you give something up, a void will form. And since nature abhors a void, something will always come to fill that void. Indeed, only a few short weeks back, militant Islamics marched boldly and loudly in front of Buckingham Palace calling publicly for Queen Elizabeth to convert to Islam, or step aside. They claim they will not rest until Buckingham Palace (and eventually the White House in the USA) are turned into Islamic mosques. What are the Brits doing about it? Nothing. Political correctness has paralyzed them. Multiculturalism has overwhelmed them. The Christian population of the nation cries out in despair. But the government, ham-strung by the promotion of secular humanism and multiculturalism for the past two decades, does nothing. You saw the news last week in which an Islamic terrorist used a van to mow down innocent Britons right in front of the British Parliament. The attacker then leapt out and began stabbing people, including stabbing a British police officer to death. Five people died. Fifty were injured and many of them might yet die of their wounds. The terror suspect was finally shot by the British equivalent of a secret service agent. As the stabbed British police officer lay dying amid other dying Britons, his last drops of blood pouring out onto the sidewalk, British emergency responders went first to try to save the life of the Islamic terrorist. That’s what unfettered multiculturalism gets you. The authorities are so afraid of appearing to be “Islamaphobic” that they actually tried to save the enemy before saving their own. The police officer died of his wounds. The Islamic terrorist died, as well. But one cannot help wonder if the police officer could have been saved if the attention of the emergency responders wasn’t on saving the Islamic attacker. This is why I go to such great lengths to document, in my brand new Bible study, “Taking and Holding Ground: a Gospel Message,” the fact that the Christian religion today is in such steep decline largely because it has rejected the conquest theology of the Bible and of the Gospel message itself, and has replaced that conquest theology with politically correct doctrine of submission, retreat and surrender. As a result, Christendom has allowed the militant heathen to come pouring into our Christian nations, demanding that we change our ways to suit them. Christianity will NOT recover from this onslaught until we once again take up the mantle of spiritual conquest through the gospel message, and carry it forth as the Christians of old once did — yes, even as Christ Jesus Himself once did. If you’ve not done so already, I urge you to click the link to the Bible study, below. It will download to your computer as a PDF file. You can then save it to your computer and read it on your screen. Or you can print it out and read it at your leisure. If you want to know the Biblical solution is to the Islamic onslaught against Christendom, this study explains verse-by-verse from the Bible what Christians MUST now do. Our utter failure in the final days of this flesh earth age to take and hold spiritual ground on behalf of the Lord, through the bold preaching of the Gospel message, is costing us dearly. The Bible provides the answer. The question is, will we listen in time? Download and read Taking and Holding Ground: a Gospel Message to learn more about what God’s Word says on this critical issue.